This came on a day when the RJD supremo, serving a jail term in fodder scam cases, left AIIMS on a wheelchair after being discharged by the hospital in the national capital, even as his party termed the move a "conspiracy to murder him". Opening a fresh offensive against RJD Chief Lalu Prasad Yadav, Bihar Deputy Chief Minister Sushil Modi on Monday accused him and his family of buying a posh property from Tata group through shell companies at a 'throw-away price' and of extending undue favours to the conglomerate. Hitting back at Sushil Modi, RJD accused him of indulging in "below the belt politics". The Rashtriya Janata Dal president had written to the AIIMS director, asking that his treatment be continued at the hospital till he recovered. In Bihar's capital, Sushil Modi asserted that both Lalu Prasad and Rabri Devi during their tenures as chief ministers had extended favours to the Tatas and in return the industry house too extended favours to the RJD chief and his family. No immediate comments were available from Tata group. Asked why did not he get the matter probed as the NDA government is in power at Centre as well as in the state, Modi said it would be better for Lalu Prasad's family, the owner of the property, to speak about it. Besides, the Income Tax Department should ask Tata company why it sold the property to a fake company, he said. Referring to a sale deed, Modi said the Income Tax department had in February attached a 7105 sq ft two-storeyed house at 5, Riding Road in Patna, located close to the airport and registered in the name of 'Fairglow Holding Pvt Ltd'. The BJP leader alleged that this is the sixth shell company through which Prasad's family has acquired benami properties and modus operandi in this case was the same as the others - that they bought the property through a sick company, which had no turnover nor any business, employee and negligible investment before finally becoming directors of the company. The sale deed was executed in 2002 when Rabri Devi was the Bihar chief minister, Modi said and questioned how Tejashwi, his elder brother Tej Pratap Yadav and sister Ragini had become directors of the sick company later. The sale deed showed one Prabhat Sinha, the Chief M&S Administration, TISCO, Kolkata, as the vendor representing the steel company, he said. "Lalu Prasad's family including his son Tejashwi Prasad Yadav acquired a two-storeyed building of Tata Iron and Steel Company located in a posh locality of Patna worth crores through a shell company named 'Fairgrow Holding Pvt. Ltd.," he said. Modi also alleged that the RJD chief's daughters Misa Bharti and Rohini Acharya were admitted to Tata Medical College, Jamshedpur on Tata quota. Daughters of former RJD minister and RJD leader Iliyas Hussain and ex-MLC Anwar Ahmad were also admitted to medical college through Tata's seat quota, he accused. Modi questioned why Tatas sold the property in a prime location "at a throw away price to a fake and sick company" and how did Lalu Prasad's family members became directors of a sick company 10 years after the execution of the sale deed. He also demanded to know the identity of one Rajesh Kumar who he alleged of paying Rs 65 lakh on behalf of Lalu Prasad's family at the time of the registry of the property. Modi said Tejashwi Yadav has not responded to any of his charges and instead used abusive language against him. Lodging of cases relating to benami land transactions against Tejashwi Yadav by the Enforcement Directorate and IT Department had triggered a political upheaval in the state in July last year and Chief Minister Nitish Kumar had walked out of the Grand Alliance comprising his JD(U), RJD and the Congress and returned to the BJP-led NDA. Reacting to Sushil Modi's charges, RJD spokesman and MLA Shakti Singh Yadav said his 'expose' showed that he was "mentally bankrupt". "Everything is in the people's domain. 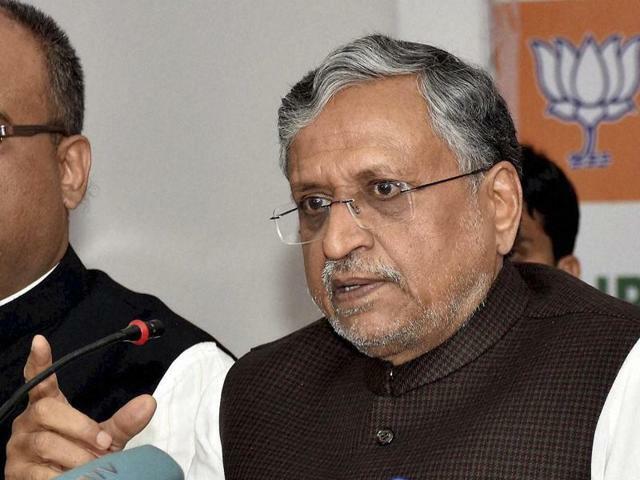 He (Sushil Modi) has termed even Tejashwi Prasad Yadav's registered properties as benami," Yadav said. Terming Modi's accusations as "below the belt politics", he said that Sushil Modi's politics thrives on criticising or making allegations against Lalu Prasad and his family. In a counter-attack, the RJD spokesperson asked why Modi has not explained how his brother became owner of Rs 10,000 crore real estate property despite hailing from a modest background.